​Among many email solicitations we received in September was a letter from a textbook company welcoming us “back to the head of the classroom.” This struck us, not as odd, but as a disappointing reminder of the pervasive assumption about what is at the very foundation of teaching and learning. The teacher’s role as the dispenser of knowledge in the classroom is axiomatic for most. And the most efficient dispensing happens when she is at the front of the room. In many ways, the pervasive notion of a teacher-centered classroom is not surprising. For thousands of years, students have been learning from teachers. The Socratic method, highly engaging and interactive though it might be, supposes that the teacher has the knowledge, asks the questions, and skillfully leads the student to the knowledge through those questions. More recent innovations like the flipped classroom move lectures from classroom time to homework time; yet, the lecture is still assumed to be integral. It seems as if all learning models, whether online or face-to-face, are predicated on the notion that learning happens through the delivery of content, from teacher to student. Even when we develop new and exciting content, innovative teaching is about finding new ways to deliver that content. True innovation, ought to extend to the very foundations, instead. Should we be delivering content at all? Perhaps teaching can be more about creating an environment that fosters the discovery of content. The Harkness pedagogy, the hallmark of Phillips Exeter Academy in Exeter, New Hampshire, challenges us to establish such an environment. "What I have in mind is [a classroom] where [students] could sit around a table with a teacher who would talk with them and instruct them by a sort of tutorial or conference method, where [each student] would feel encouraged to speak up. This would be a real revolution in methods." The result was "Harkness Teaching," in which a teacher and a group of students work together, exchanging ideas and information, around a table. All classrooms at Exeter have Harkness tables, and students who enter accept that they will be responsible for the discussion that happens at that table every day. It is a given. They must come prepared, with completed homework, and ideas to offer. The lesson “plan” for the day is created by the students, as they explore and discuss ideas together. The teacher facilitates discussion without directing it. When trying to describe Harkness to other educators, its application to mathematics seems to generate the most skepticism. Math involves procedures and formulas, calculation, logic, and correct answers. What is there to discuss? At Exeter, the answer lies in great part in our problem sets. In 1992, the Math Department at Exeter decided to reject standard textbooks in favor of problems, and spent the next eight years developing them. These problem sets, perfected through editing teams each summer, are free and available on the Exeter website. Each year, more schools are adopting and adapting them for use with their own students. 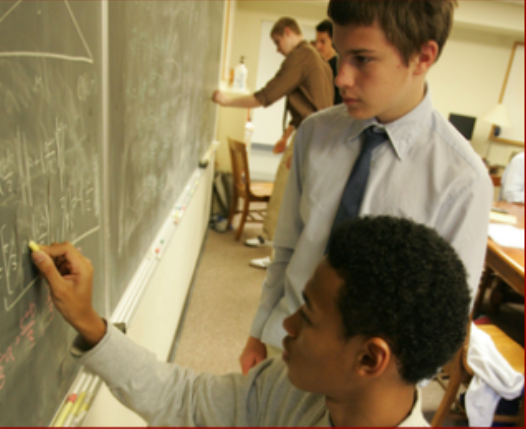 To implement this educational philosophy, members of the PEA Mathematics Department have composed problems for nearly every course that we offer. The problems require that students read carefully, as all pertinent information is contained within the text of the problems themselves—there is no external annotation. The resulting curriculum is problem-centered rather than topic-centered. The purpose of this format is to have students continually encounter mathematics set in meaningful contexts, enabling them to draw, and then verify, their own conclusions. As in all Academy classes, mathematics is studied…with students [usually 12] and instructor seated around a large table. This pedagogy demands that students be active contributors in class each day; they are expected to ask questions, to share their results with their classmates, and to be prime movers of each day's investigations. The benefit of such participation in the students' study of mathematics is an enhanced ability to ask effective questions, to answer fellow students' inquiries, and to critically assess and present their own work. The goal is that the students, not the teacher or a textbook, be the source of mathematical knowledge. The problem sets are collections of interwoven concepts that integrate mathematical ideas across subjects. There are five books, creatively titled Book 1 through Book 5 spanning the major secondary courses Algebra I, Geometry, Algebra II, Trigonometry, Calculus, and Multi-Variable Calculus. The uniting theme is clearly problem solving, however a student in Book 4 studying calculus will be asked to make a geometric argument about derivatives or a student in Book 2 studying Geometry will be encouraged to find measurement graphically on a coordinate plane. This idea of reoccurrence presses upon the student to seek mastery through process and analysis not simply through memorization. Additionally, the assortment of content, often presented in a real world context fosters an appreciation for math outside the classroom. Even experienced math teachers who work through the problems for the first time discover new ideas and rich connections. The problem sets don’t introduce any unique mathematical ideas. As a curriculum, however, it is innovative in how students (and teachers) think about math. We doubt if anyone could definitively say a particular curriculum is superior to another for every student. We believe that curriculum developers have a specific outcome and audience in mind when they compose material. The end result is generally true to the intention. What’s left to decide is how well it services the needs of our students. There are unique cognitive obstacles for students in a math classroom; memory of rules, fluency of terminology, sequential ordering for problem solving, spatial awareness to identify operations and conduct geometric reasoning. Most curricula will isolate these cognitive functions initially and gradually require students to simultaneously operate. What the curriculum at Exeter does well is challenge students to make this adjustment continually from the outset. Through careful design the student is able to learn rules and formulas by discovery. Students are immersed in the language of math first because the problem sets are essentially a series of word problems and secondly by the nature of a Harkness classroom. Students are groomed in the art of problem solving from day 1 and intriguingly this training is done through peer interaction. The marriage of Harkness and the problem sets promotes spatial awareness as students are routinely asked to write equations and make drawings at the board. Again, more often than not, all of these cognitive skills are tied together seamlessly. On previous problems, students will have worked with right triangle trigonometry, the unit circle, and parameterizing motion. We might start the Ferris wheel problem in class, with students working at the board in pairs. Our first suggestion would be to make an accurate drawing of the problem. This drawing is key to making progress; it requires spatial awareness and linguistic understanding of what is being described. As we circulate through each group we might ask about the important information and what approach they are considering. To answer that, students need sequential ordering and recall of relationships. Once the drawings are complete, eventually one student, if not more, will realize the key to unlocking this problem is finding the central angle that corresponds to Jamie’s anxiety periods. We would make a conscious effort not to short circuit the problem solving or discovery by guiding them to the next step. We tend to offer leading questions to students who are stuck, but students are aware that the responsibility is theirs. In fact, that responsibility most often begins with the homework. Students work on six to eight problems each night – sometimes recognizing the need for an elegant tool developed in a previous problem, sometimes plugging away with a brute-force solution, and sometimes having little idea where to begin beyond sketching a diagram. Students must attempt problems for which there are no cues in the form of chapter headings, or sample solutions that precede them. Instead, the problems require them to consider a question, and search their own “toolboxes” for possible strategies. Again there is no new mathematics here, but there is a wealth of engaging real-world problems that challenge students in multiple ways. Sami spent countless hours as a public school teacher writing and searching for this very type of problem. If you open most textbooks you will find a challenging problem section in each chapter, one, maybe two or three problems that require students to call upon the aforementioned cognitive skills. The Exeter math curriculum presents these problems recurrently. And over time students are trained to employ the spectrum of cognitive skills to solve problems that are grounded in rigor and highlight the relevance of math in their lives. 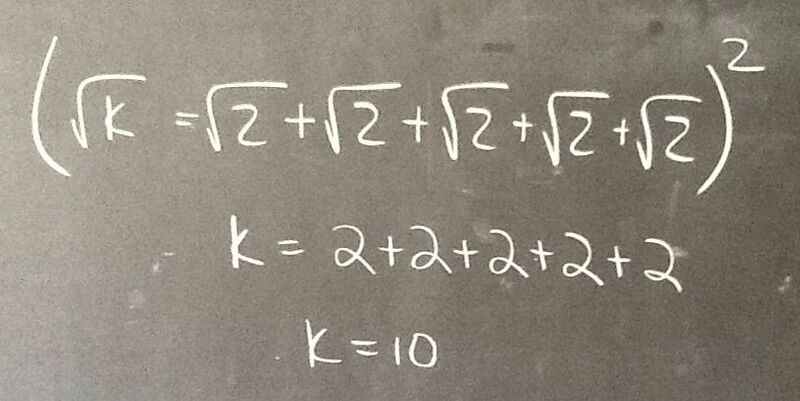 This is what separates the Exeter math curriculum from others. But the problem sets are only part of the story. The classroom is where the real power of teaching and learning together happens. Students bring their work to class, and immediately go to the boards lining the walls to “put up a problem.” With class sizes of about 12, sometimes all the problems are taken, but they might join up with another student and compare approaches. After about 10 minutes, students gather back at the table to discuss each homework problem. The author of each solution presents her thinking, and the class responds. In a class where students have become comfortable with each other, with making mistakes and exposing misconceptions, what usually results is a lively conversation in which the teacher is on the periphery. The students are generating the work, the questions, and the answers for their classmates. The teacher is not superfluous. It is not an easy task to foster an atmosphere that results in this kind of sharing of ideas and a sense of responsibility from the students for the collective work of the class. At the same time, the teacher needs to develop the sense of when to hold back and let the group wrestle with elusive concepts, and when to step in to help guide them forward. The process can be messy. But learning itself is never as neat and tidy as a well-planned lesson might make it appear. Karen’s class of ninth graders tackled the following problem one cold afternoon in December. (Math 1, page 86) On the surface, it was not particularly interesting, engaging or contextual. Tom put his solution on the board, and explained his method. 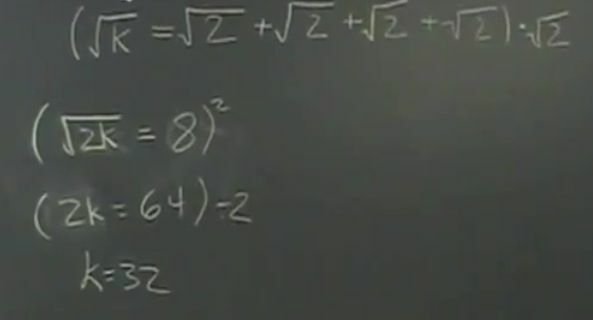 He had multiplied both sides of the equation by √2 concluding that k = 32. 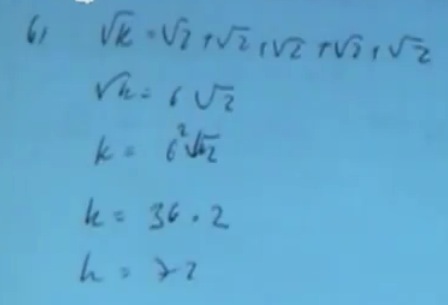 Puzzled, Alan asked to present his solution, one that had yielded a different answer of k = 72. In the silence that accompanied his trip to the document camera, Corey quietly noted that Tom had copied the problem down incorrectly. Alan’s solution included a similar mistake, but an alternate method in which he had collected the √2’s. 5√2 = √25 √2 = √50. By consensus, we moved on to the next homework problem. Standing at the board, instead of sitting at the table among the students, Karen could have presented the solution to this problem, and addressed misconceptions and mistakes in about 30 seconds. It took them much longer, but they got there largely on their own, and for that reason carried away a deeper understanding than they would have from any presentation by the teacher. In recalling his time as public school student in the inner city, Sami remembers those days of “chalk and talk” and “plug and chug” math. One of his more memorable moments was experiencing an alternative curriculum at that time called Integrated Math Program (IMP). Each unit in this curriculum was premised on a guiding question similar to the example of the Ferris wheel from Book 3. Certainly my classmates and I were unable to solve the problem initially, but by design we discussed, discovered, and mastered all the prerequisite knowledge in subsections. I recall the feeling of accomplishment and purpose with each completed step. I also remember the sentiment of intrigue and anxiousness to see how the pieces would fit together. I hear these same notions from my students about math at Exeter. Sami often wonders how effective this curriculum might be at schools where he previously taught. What, if any, could be used? Could the problem sets be used without the Harkness model? How would his former colleagues adjust? These are all valid concerns, and certainly would require thought and planning. He is convinced that there are huge verbal hurdles for students, not to mention a considerable amount of professional development needed for teachers. As Sami ascertains the logistics, he is gripped by the thought that he may have done a disservice to his former students – defaulting to the stereotypical approaches of memorizing and calculating, all while neglecting the question of why. Forcing mathematics upon students with the justification that “you might not need this in life but you’ll certainly need it to pass my class” is a sad but actual state of affairs across the country in many high school classrooms. He has never offered such a suggestion to students, but it is all the same if we as teachers fail to communicate the long-term goals of mathematics, and fail to provide students with the opportunities to experience mathematics as an endeavor in its true form. It’s a fact that not everyone will like or fully understand mathematics but to not appreciate it as a science and an art is a failure of a different sort. Teachers delivering content, on either traditional or innovative platforms, miss the mark. Our students are able to be much more active learners and thinkers, if we can step away from the front of the classroom and put interesting and engaging problems before them instead. It is our responsibility to empower students to think critically, creatively, and collaboratively to solve meaningful problems on their own. It is possible to do so without sacrificing content. But the value of such an outcome transcends content, and trumps traditional teaching and delivery. We should expect more from our students, and they should expect nothing less from us. Karen Geary was appointed to the faculty at Phillips Exeter Academy in 1996 as an instructor in science. After teaching physics for 10 years, she joined the math department. Karen currently serves in an administrative rotation as the Dean of Academic Affairs. Sami Atif joined the math department at Phillips Exeter Academy (New Hampshire) in 2012, after teaching in at the Kent County Alternative Program in Delaware four years. Sami is a published mathematician and a student of pedagogical philosophies.